Choose your Lake Austin adventure - kayak, canoe, paddle boat, stand-up paddleboard or tour the lake on water bikes. More into kicking back and relaxing? No sweat. Party boat and pontoon rentals are also available. Squeeze in as many ice cream breaks as possible this summer. Hit locally loved Amy&apos;s Ice Creams for a scoop of their famous Mexican vanilla or try seasonally inspired creations (think strawberry-basil and tart toasted coconut) at Lick Ice Creams. Head to Austin&apos;s new world-class, open-air venue - Austin360 Amphitheater - for big summer concerts like the Dave Matthews Band, Avett Brothers and Mumford and Sons. Ride the Zilker Zephyr Miniature Train along Lady Bird Lake, jump around the Zilker Park playground and then hit the Austin Children&apos;s Museum for incredible educational exhibits. 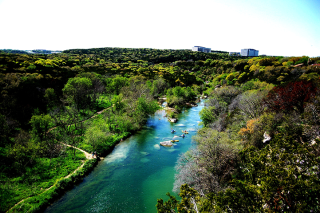 A true Austin gem, spring-fed Barton Springs is the perfect place to work on your tan and splash around with friends. Bonus: No matter what the outside temp is, the pool hovers around 68 degrees year-round. There&apos;s nothing like a summer day on Lake Travis. Take in the gorgeous scenery and glide across the water in a single or tandem kayak or try stand-up paddleboarding and discover for yourself why it&apos;s the fastest growing water sport around. Watch family-friendly flicks like Ghostbusters on the grassy knoll or from an inner tube in the 70-degree water at Deep Eddy Pool with the Summer Splash Movie Series Saturdays at dusk. The Congress Avenue Bridge shelters the largest urban bat colony in North America. More than 1.5 million bats fly out near dusk April through October. You can also enjoy the bats on a sunset cruise with Capital Cruises. Enjoy jazz, Shakespeare, family films and musicals at the Zilker Hillside Theatre. The outdoor amphitheater hosts performances Thursday - Sunday in July and August. Fly over treetops on the ninth longest zipline in the world. Lake Travis Zipline Adventures tours serve up a boat ride, private lakefront park fun and five zipline options ranging from 250 to more than 2,600 feet.